Does the prospect of living alone fill your clients with dread? Most of us are social creatures and prefer the company of others to solitude. However, the thought of living alone may conjure up images of the image of loneliness and only having your own 4 walls to talk to. And yet there are others who relish their own company and after living alone for a while pronounce that they could never imagine sharing a home with anyone else. If your client fits into the former category then they could have a Fear of Living alone. 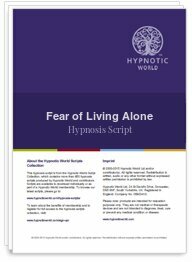 This script from Hypnotic World can help your clients to actively look forward to the time when they will have their own place and the opportunity to meet new friends and extend their social life. Download this script today to help your clients to overcome their fear of living alone.